The Medical Dental campus contains one on campus apartment, Med-Dent, and one privately owned affiliated property. The Medical/Dental Complex is located at 627 S. Preston Street on the downtown Health Science Campus. This is a mixed facility of resident apartments, short-term guest apartment units and administrative offices. 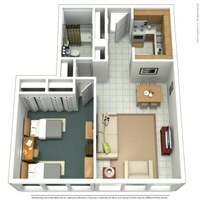 The apartments range from studio style to one-bedroom apartments. All apartments in this facility are furnished and include full kitchens. It is within walking distance of "4th Street Live" and is a short drive from Bardstown Road. Med-Dent houses many non-traditional and international students. MDA Residents are required to set up a payment plan or pay their semester balance in full. Residents can find information about Student Payment Plans on the Bursar's website. The Quad is an Affiliated Property apartment complex located in Downtown Louisville that offers studio, one bedroom, and two bedroom apartment options. 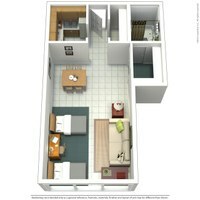 Located close to the University of Louisville Hospital and the Health Sciences Campus, The Quad is a great option for upper class and graduate level students. If you are still searching for a housing option as an HSC student or are interested in posting a listing, you can visit the Off-Campus Housing website for more information!